Jovan Dučić, the most prominent Serbian poet and diplomat, was buried in the church of the Annunciation of the Most Holy Theotokos, the Herzegovinian Gračanica, on the Crkvina hill. The church is the third replica of the Gračanica church in Kosovo in the modern Serbian history. Crkvina, a hill in the Eastern part of Trebinje, wherefrom the city, the Trebišnjica river and its bridges burst upon the view, has represented a place of pilgrimage and tranquility for centuries. The Herzegovinian Gračanica was built on the place where, in the past, stood the church of Saint Michael, the medieval endowment of King Milutin. At the congress of Serbian unity, held in September 1999, Branko Tupanjac, a businessman from Chicago, born in Bileća, stated his willingness to be the endower of the Herzegovinian Gračanica church, the foundations of which had already been consecrated. He visited Trebinje in December 1999 and discussed the construction details with Bishops Grigorije and Atanasije. The construction works started in March the year after. Benison to design the church was given to Predrag Ristić whose task was to design visual expression of Dučić’s testament. The church was built in a typical Byzantine style yet, as the architect says, ‘not an overstated or grand, not literal, sterile museum copy, but a continuation of the Gračanica myth; once and for all the given Sacred Mystery established as an everlasting and contemporary law of all times’. Its structure is a composition of various construction materials deployed in accordance with the requirements of the old times and contemporary trade. The walls are made of reinforced concrete with the inner ones covered with bricks and the outer ones with tufa interrupted by brick decorations. The foundational stone blocks are from Popovo polje, the tufa is from Taor while the brick is from Čereviči (Vojvodina). As it is not the ordinary lime that is usually used in the structures of this kind, the lime from Nevesinje (more than 20 years old) was used. 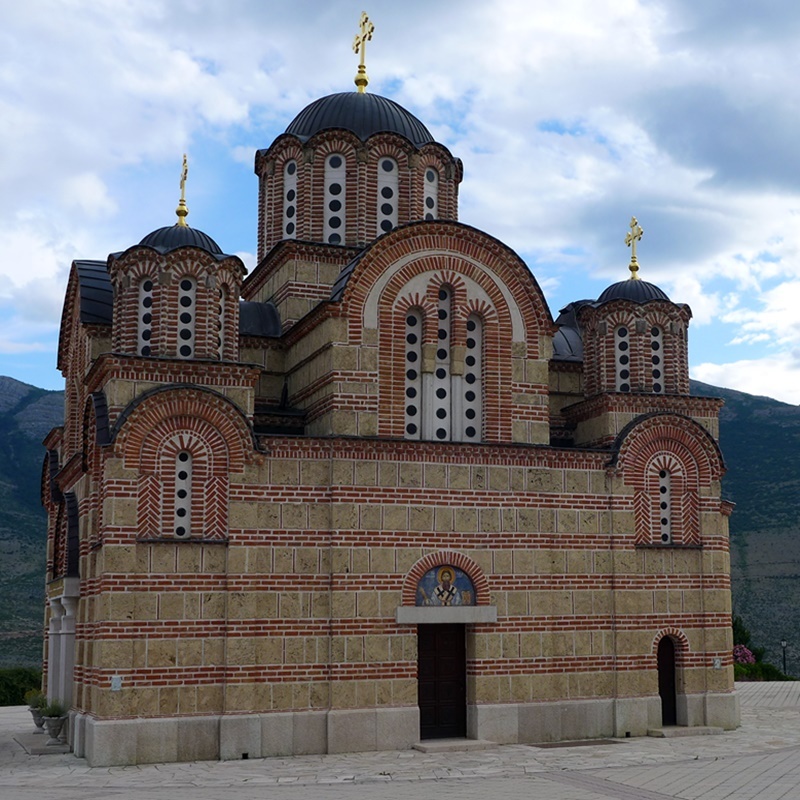 The church is a five-domed one, erected on 16 pillars, each of square cross-sections save one with circle-shaped base which is leaned onto a stone brought from the Gračanica church in Kosovo. The floor artistic design is the work of Vladan Banković from Belgrade and it represents a copy of the floor in Saint Archangels church in Prizren, the Emperor Dušan’s endowment. The church walls are painted with al secco technique under the distinct influence of Stamatis Skliris’ Byzantine painting style; the credit for painting the walls goes to Aleksandar Živadinović and his assistants. The main icons are the work of sister Tekla from the Dobrićevo monastery while the iconostasis was made in the Tvrdoš monastery. The polyelos is a gift from Radmila Tupanjac, the endower’s wife, and it was ordered from Thessaloniki. The crosses were made by the ‘Tools Factory’ in Trebinje and gilded by Boris Ivančev from Novi Sad. The bells were made in a foundry in Futog. The church was consecrated on 22 October 2000. The ceremony of transfer and burial of Ducic’s remains on Sunday morning commenced with the consecration of the church, the iconostasis and the altar. The act of consecration was performed by His Holiness Serbian Patriarch Pavle, Bishops Grigorije and Atanasije and a number of metropolitans, bishops and presbyters of the Serbian Orthodox Church. Interesting enough is the fact that among the presbyters was the 93-year-old archpriest Rade Vukomanović, one of the few Dučić’s contemporaries whom the poet had asked, on the occasion of unveiling the monument to Petar Petrović Njegoš in Trebinje in 1938, to serve the Liturgy in his church. Tens of thousands of citizens and dignitaries from Herzegovina, the Republic of Srpska, Serbia, Montenegro and from abroad gathered to bid farewell to Dučić. At the ‘Keepeing Dučić’s Vow’ observance, academician Matija Bećković bid farewell to the poet reiterating that Dučić and freedom had come side by side to our country. Bishop Grigorije read out the note left at Dučić’s grave by the pupils of ‘Jovan Dučić’ primary school from Čajetina: ‘Forgive us for having you left for so long in the foreign land; rest in peace at your Crkvina’.